Education and Children’s Services Convener Councillor Jim Paterson visited staff and pupils at St John Ogilvie Primary School this week after it received a glowing report from school inspectors. 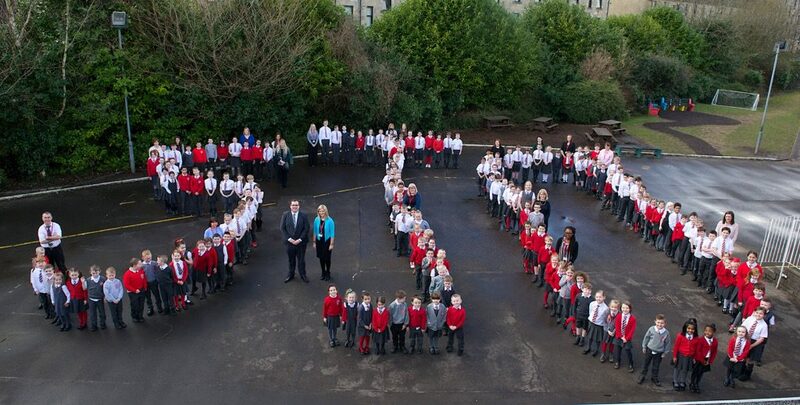 The Paisley school was praised by Education Scotland for improving children’s attainment and achievement. Inspectors made a two day visit to the school where they talked to parents, carers and children, as well as staff. The school was awarded ‘very goods’ for raising attainment and achievement and self-evaluation for self-improvement. The ‘high quality leadership’ of head teacher Lorna Murray, supported by her depute, was also noted. Children were happy and confident and the school’s ‘warm and welcome environment’ for learning and improvements to children’s reading was also praised. St John Ogilvie runs regular committees such as the pupil council, enterprise committee and junior road safety, with every pupil involved. An electronic profiling system means examples of children’s learning can be shared with their parents. Head teacher Lorna Murray said: “I am very pleased that Education Scotland recognised the high quality team work from staff, pupils, partners and parents. As head teacher I am exceptionally proud of our pupils and the school community. We all work together to provide fun and engaging learning opportunities for our pupils and this shows through our happy and confident children. Education Convenor Councillor Jim Paterson said: “We are committed to giving every child in Renfrewshire the best start possible and for them to fulfil their potential. The report highlights the wonderful work being carried out at the school and how there is a genuine enthusiasm for learning among pupils. “I’m delighted to see first-hand how happy, confident and enthusiastic the children are, which is testament to the hard work of the head teacher and her staff.